Since we have Baconpalooza coming up on May 8th, I of course started googling Bacon.I have seen so many jokes and memes all about Bacon since then. 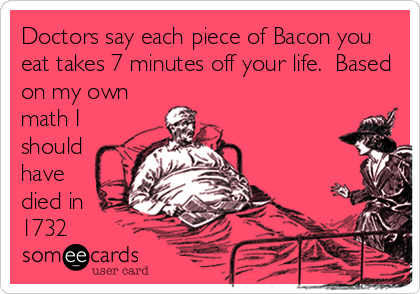 So I decided I'm going to share my favorite 10 bacon jokes and memes. Q: Why did the pig go into the kitchen? A: He felt like bacon. The bartender tells them 'We don't serve breakfast here!" Why Didn't Anyone Want To Play Ball With The Pig? Because he always hogs the ball! Which Celebrity Smells The Best?